Works with heat/cool systems, including advanced 2-stage systems. Perfect for anyone whose schedule varies throughout the week. Award winning INSTEON technology : the ultimate in simplicity and reliability. 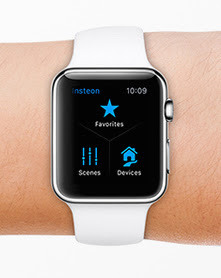 Control on Apple Watch: with the Insteon App on Apple Watch, you don't even need to reach for your iPhone to adjust the Thermostat. Change your Thermostat mode right on your wrist.